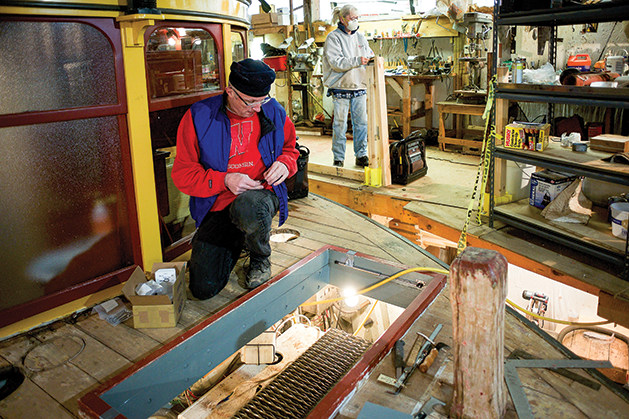 A local crew of mostly volunteers works hard each spring to get the historic steamboat Minnehaha ready to launch into Lake Minnetonka’s waters for the summer boating season. 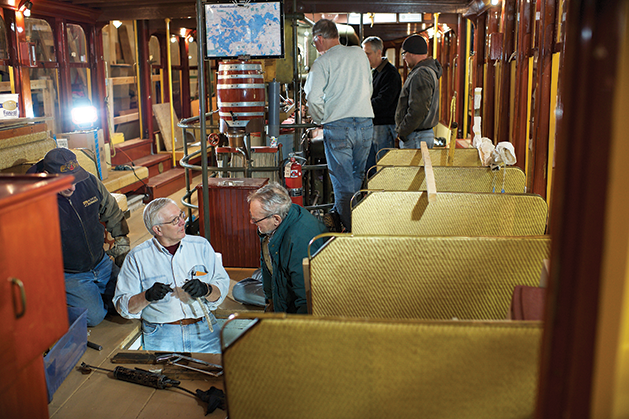 Local photographer Jim Douglas captures the detailed process of cleaning, painting and making the steamboat seaworthy once more. (Pictured above) The steamboat Minnehaha under steam on Lake Minnetonka, captained by former U.S. Navy pilot Tom Roberts. Other crewmembers include two pursers and an engineer who oversees the boiler and engine. Unlike the original boat, which relied on coal as a fuel, the current Minnehaha is powered by oil. 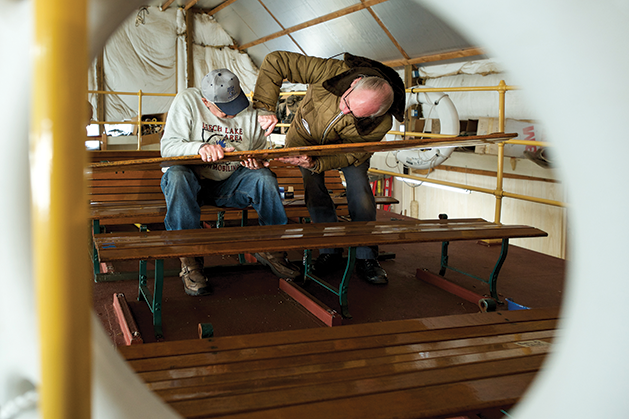 (Below left) Framed by one of Minnehaha’s many lifesavers, Chuck Tschida and Ken Kaiser remove screws from a topside bench. It will soon be sanded and a new coat of varnish will be applied. Other seating slats might be replaced due to damage from use or the elements. (Above right) Occasionally six hands are required to get the job done. 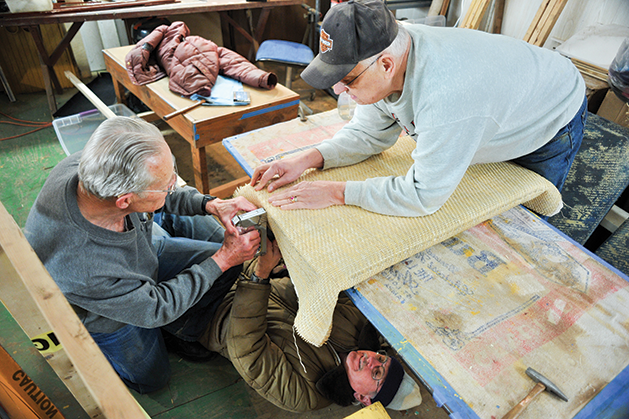 While Chuck Tschida, right, and Ken Kaiser, bottom center, hold cane seat covers in place, John Palmer staples a new covering on an old seat. (Below left) Inside the main deck cabin, volunteers concentrate on several projects both below decks and in the engine compartment. Pictured at center, project manager Jeff Schott explains maintenance that must be completed as part of the boat’s annual overhaul. 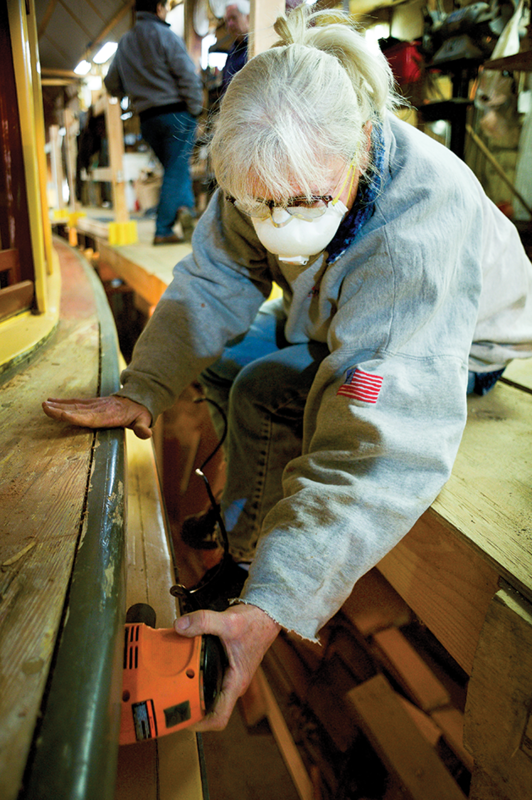 (Above right) Before the Minnehaha is painted, exterior wooden surfaces are sanded by hand as well as with mechanical sanders. During summer operations, Kathryn Schafer is a purser, but in the winter she often lends a hand when maintenance becomes overwhelming. (Below left) Volunteer Karl Newman is largely responsible for hull repairs and painting. The main deck, aft of the cabin, has been stripped and sanded and prepared for two new coats of paint, a project that will take several days to complete. 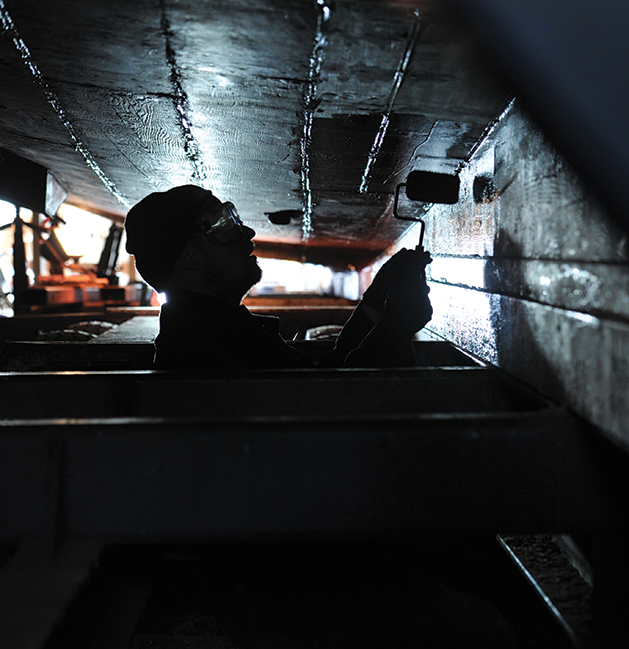 (Above right) With the 70-foot steamboat Minnehaha cradled on its trailer, Rusty Herman wriggles through a latticework of steel to paint the bottom of the portside hull. 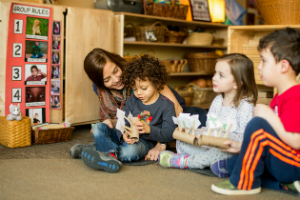 It’s a tedious and demanding task requiring patience for those agile enough to squeeze into tight spaces. (Below left) If you can hold a brush and not tip over the paint can, you’re a painter—and there’s no shortage of surfaces to paint on Minnehaha. 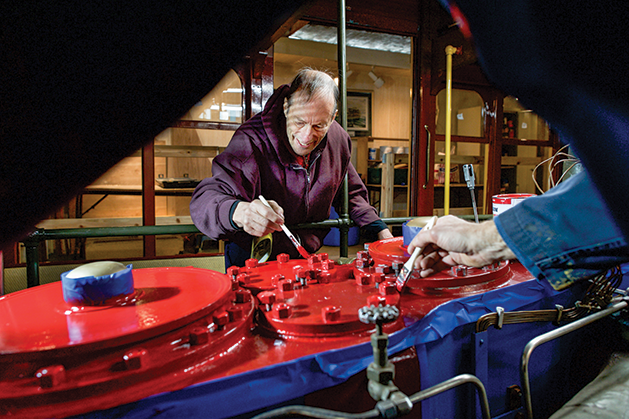 Art Abrahams, pictured, and Steve Albrecht apply a second coat to the steam engine, which is nestled amidship and below the main deck. (Above right) Jeff Jensen, with his pup A.J. 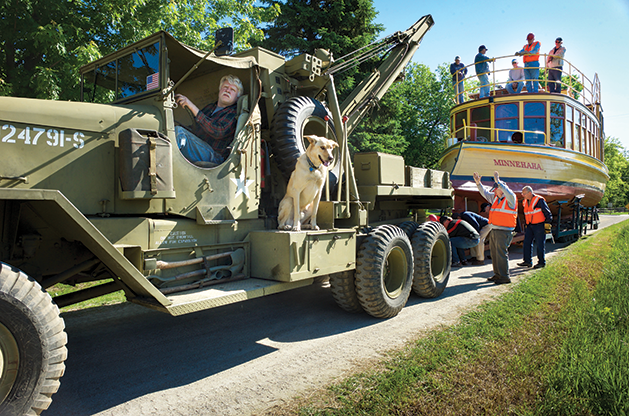 nearby, hooks up his World War II U.S. Army tow truck to the Minnehaha. Terry Burns indicates only two feet separate the truck and the boat’s trailer. Jensen will creep forward at three miles per hour to Shorewood Yacht Club, where the boat will be slipped into Lake Minnetonka. 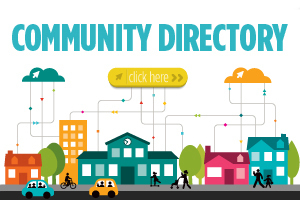 To learn more about Jim Douglas and his work, visit the website here.